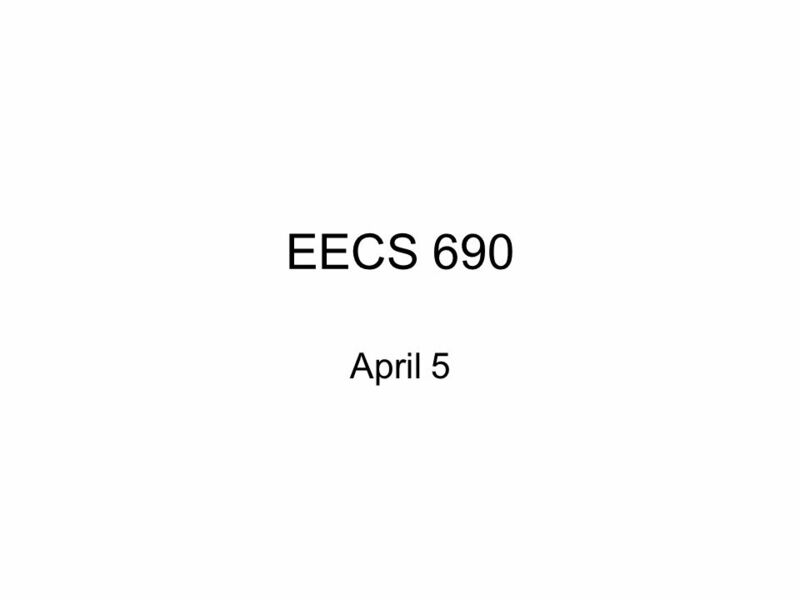 EECS 690 April 5. Type identity Is a kind of physicalism Every mental event is identical with a physical event In each case where two minds have something. 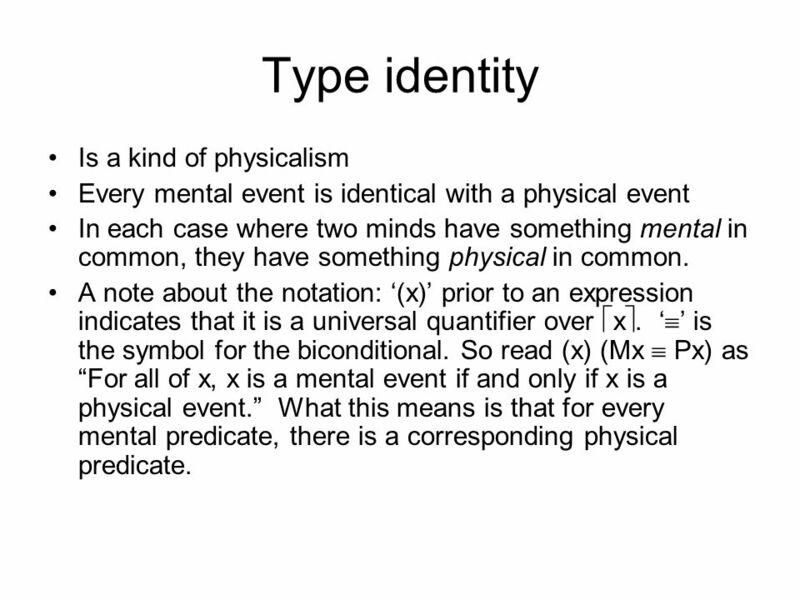 2 Type identity Is a kind of physicalism Every mental event is identical with a physical event In each case where two minds have something mental in common, they have something physical in common. A note about the notation: (x) prior to an expression indicates that it is a universal quantifier over x. is the symbol for the biconditional. So read (x) (Mx Px) as For all of x, x is a mental event if and only if x is a physical event. What this means is that for every mental predicate, there is a corresponding physical predicate. 3 Problems with type identity The second claim it makes is hopelessly too strong. There are small but noticeable differences between individual persons brains that dont lead us to attribute different mental predicates altogether to them. 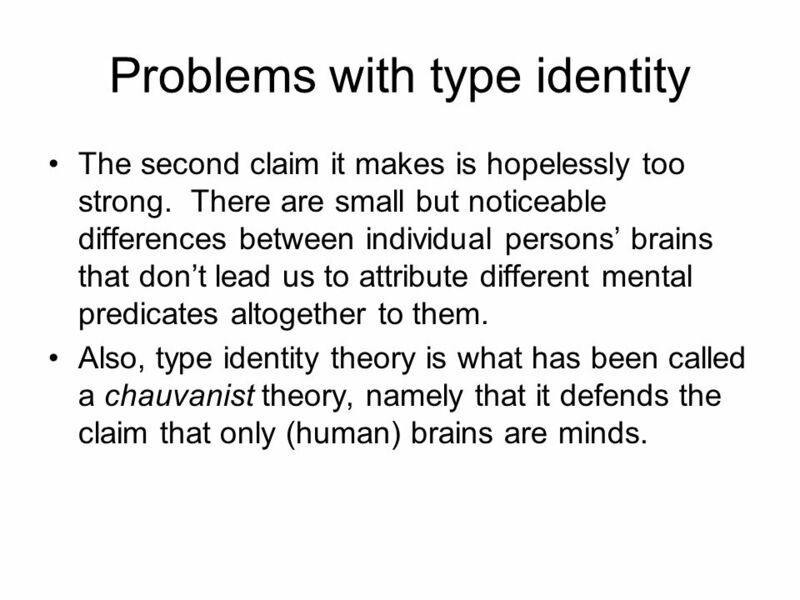 Also, type identity theory is what has been called a chauvanist theory, namely that it defends the claim that only (human) brains are minds. 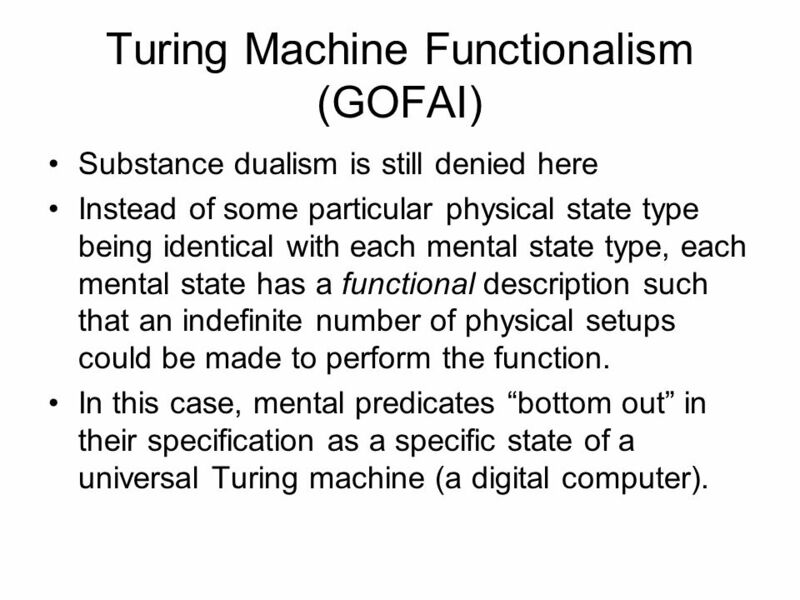 4 Turing Machine Functionalism (GOFAI) Substance dualism is still denied here Instead of some particular physical state type being identical with each mental state type, each mental state has a functional description such that an indefinite number of physical setups could be made to perform the function. In this case, mental predicates bottom out in their specification as a specific state of a universal Turing machine (a digital computer). 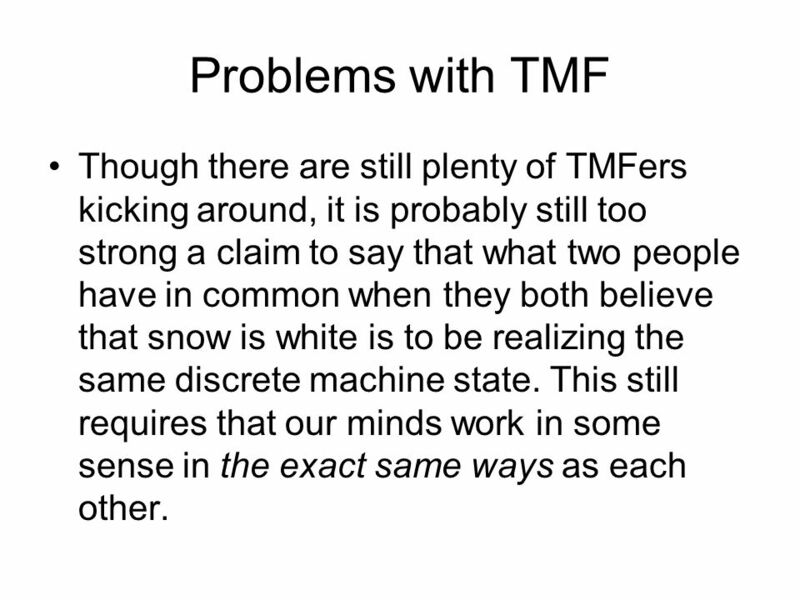 5 Problems with TMF Though there are still plenty of TMFers kicking around, it is probably still too strong a claim to say that what two people have in common when they both believe that snow is white is to be realizing the same discrete machine state. This still requires that our minds work in some sense in the exact same ways as each other. 6 Token functionalism This is the more relaxed form of functionalism that we have been operating with for the past couple of weeks. In a sense, this approach is born out of a reluctance to reduce mental predicates either to specific brain states or to specific discrete machine states. 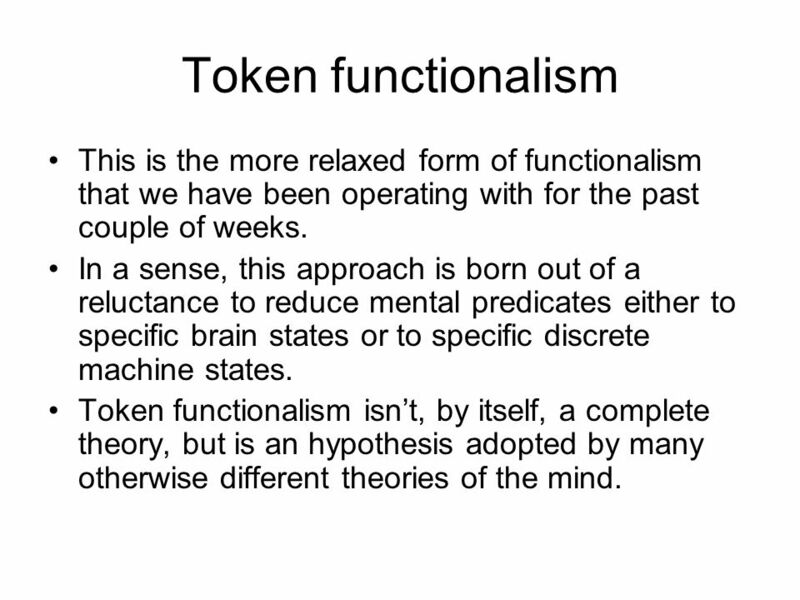 Token functionalism isnt, by itself, a complete theory, but is an hypothesis adopted by many otherwise different theories of the mind. 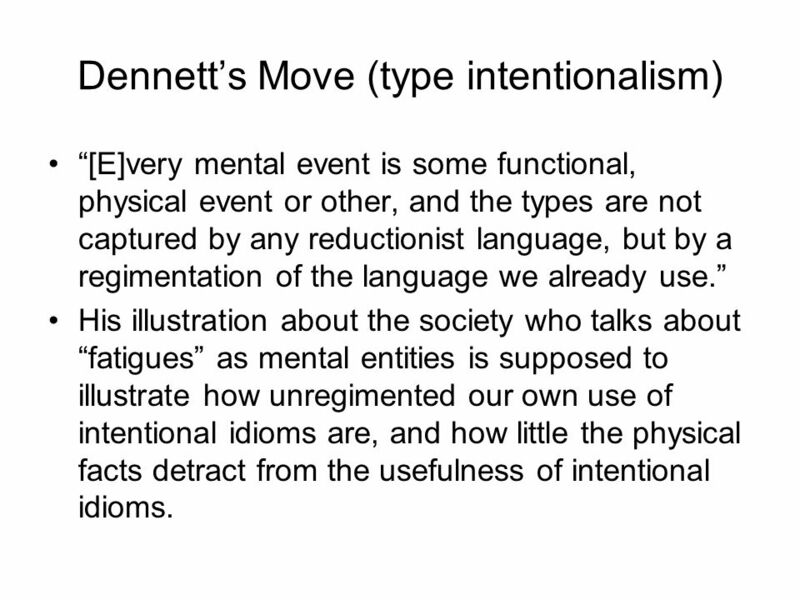 7 Dennetts Move (type intentionalism) [E]very mental event is some functional, physical event or other, and the types are not captured by any reductionist language, but by a regimentation of the language we already use. His illustration about the society who talks about fatigues as mental entities is supposed to illustrate how unregimented our own use of intentional idioms are, and how little the physical facts detract from the usefulness of intentional idioms. 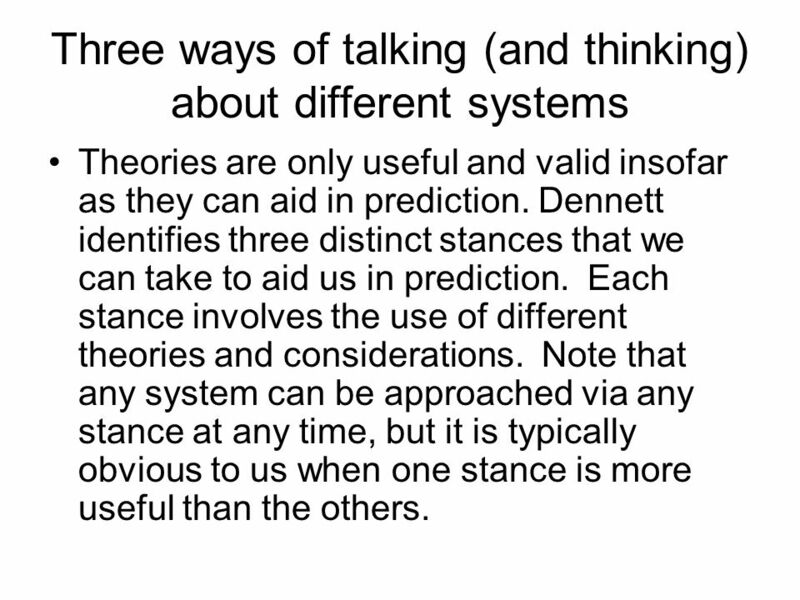 8 Three ways of talking (and thinking) about different systems Theories are only useful and valid insofar as they can aid in prediction. Dennett identifies three distinct stances that we can take to aid us in prediction. Each stance involves the use of different theories and considerations. Note that any system can be approached via any stance at any time, but it is typically obvious to us when one stance is more useful than the others. 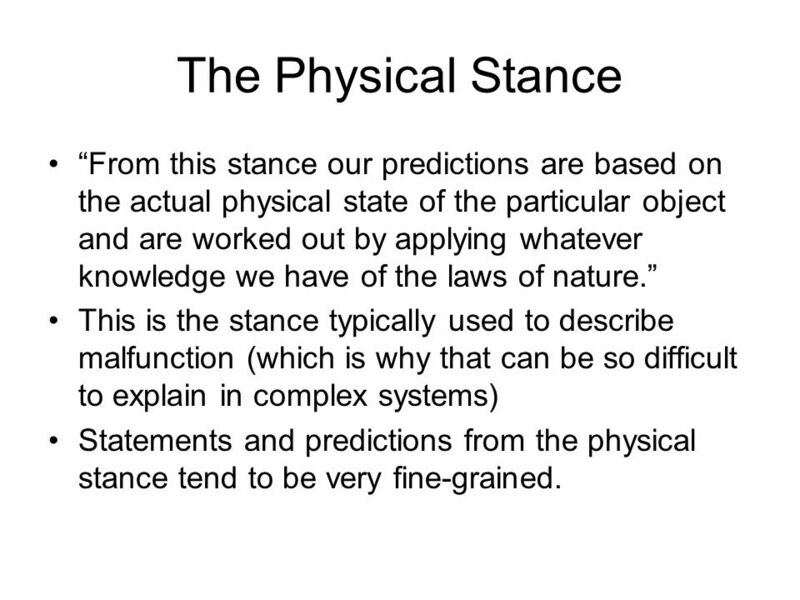 9 The Physical Stance From this stance our predictions are based on the actual physical state of the particular object and are worked out by applying whatever knowledge we have of the laws of nature. 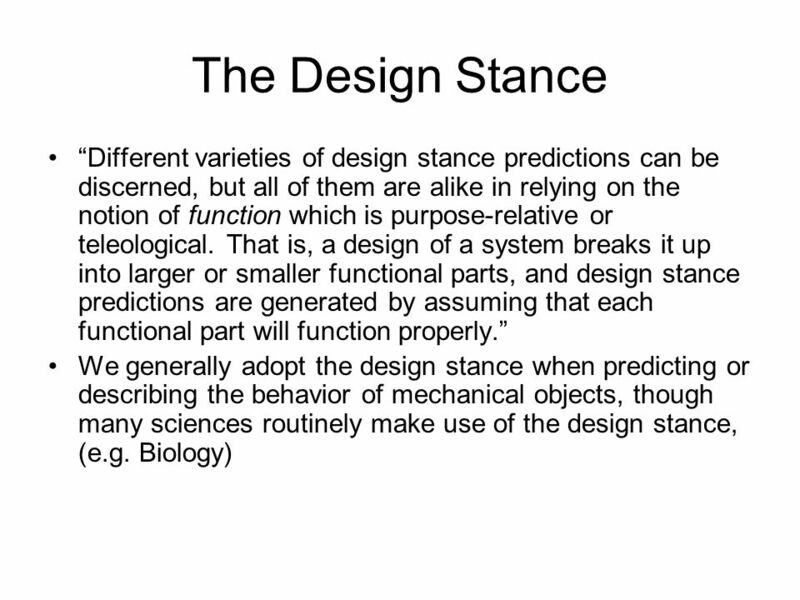 This is the stance typically used to describe malfunction (which is why that can be so difficult to explain in complex systems) Statements and predictions from the physical stance tend to be very fine-grained. 11 The Intentional Stance One predicts behavior in such a case by ascribing to the system the possession of certain information and supposing it to be directed by certain goals, and then by working out the most reasonable or appropriate action on the basis of these ascriptions and suppositions. One will arrive at the same predictions whether one forthrightly thinks in terms of the computers beliefs and desires, or in terms of the computers information-store and goal-specifications. 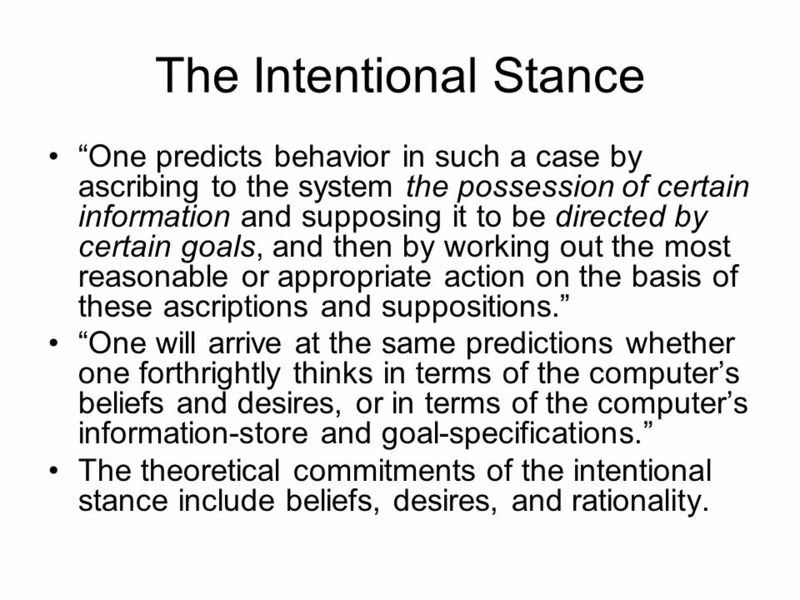 The theoretical commitments of the intentional stance include beliefs, desires, and rationality. Download ppt "EECS 690 April 5. Type identity Is a kind of physicalism Every mental event is identical with a physical event In each case where two minds have something." The value of certainty. Foundationalists suppose that true beliefs held with certainty (indubitable) together with logical and linguistic analysis offer. ARTIFICIAL INTELLIGENCE [INTELLIGENT AGENTS PARADIGM] Professor Janis Grundspenkis Riga Technical University Faculty of Computer Science and Information. Propositional Attitudes. FACTS AND STATES OF AFFAIRS. Personal Identity. CAUSAL EFFICACY OF CONTENT Breaking Glass o.
B&LdeJ1 Theoretical Issues in Psychology Philosophy of Science and Philosophy of Mind for Psychologists. Summer 2011 Monday, 07/25. Recap on Dreyfus Presents a phenomenological argument against the idea that intelligence consists in manipulating symbols according. Interactive Artifacts. Shared Understanding & Mutual Intelligibility Defines the field of social studies – Interpreting the actions of others – Goal is. CAS LX 502 Semantics 1b. The Truth Ch. 1. Can a machine be conscious? (How?) Depends what we mean by “machine? man-made devices? toasters? ovens? cars? computers? today’s robots? "Almost certainly. Philosophy of Mind Matthew Soteriou. Physicalism The physicalist answer to the question of the relation between the mental and the physical: The mental. The Problem of Knowledge. What new information would cause you to be less certain? So when we say “I’m certain that…” what are we saying? 3 things you. RENE DESCARTES ( ) Postulated a separation between the mind and the body. Body—a machine that moves in predictable ways. Mind—free and could decide. Human Nature 2.3 The Mind-Body Problem: How Do Mind and Body Relate?